Absolute worth the little climb to go to the summit of the fortificated Mont Urgull not only to see the big beach and the city from "outside" - but also the layered mountain hills in the back of this beautiful city. 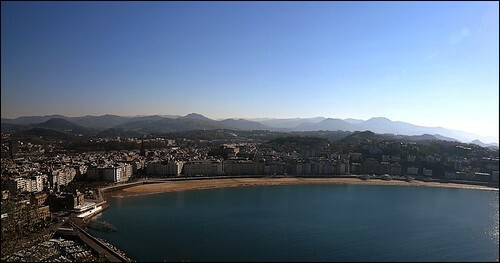 The Beach of La Concha (Basque: Kontxa Hondartza, Spanish: Playa de La Concha is a beach in the Bay of La Concha (Shell, in Spanish, due to its shape) in San Sebastián (Basque Country). It is one of the most famous urban beaches in Europe. It is a sandy beach and shallow substrate, in which the tide fluctuation affects greatly the area available for use. It can be considered an urban beach in widespread use.